[Karachi: 12th September 2014]: Leading hair care and beauty brand Garnier has launched a new range of hair color titled Garnier Color Naturals Ruby Red Collection, featuring hair color in 3 dynamic shades of red. The new collection features 3 new distinct shades; Deep Red Brown (3.6), Burgundy (4.6) and Intense Red (6.66) and is currently available at all leading retailers nationwide. 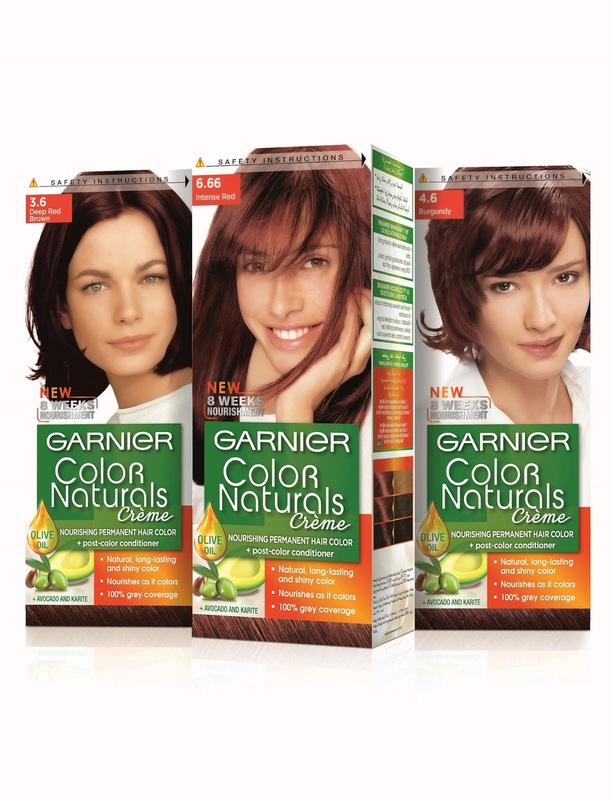 Garnier Color Naturals Ruby Red collection is geared towards women who are more open to experimenting with hair color specifically as a means to complement their wardrobe and augment their overall look. As with all Garnier Color Naturals hair products, the Ruby Red collection is sourced from natural ingredients and is enriched with natural olive oil that nourishes your hair while you color and provides 100% grey coverage. The new Garnier Color Naturals Ruby Red collection is currently available at all leading retailers nationwide at PKR 375. Garnier’s renowned range of quality hair color, hair care and skin care products include the Garnier Color Naturals product line, a hair color that is enriched with Natural Olive Oil along with Color Naturals Intensity, sourced from naturally active based ingredients. The Skin Naturals line includes Garnier Light enriched with Pure Lemon Essence and Vitamin C and Garnier Essentials with Vitamin E. In hair care the Fructis shampoo, conditioner and hair styling products are coveted. All of these lines have a wide range of products for the hair and skin, including hair color, shampoos, conditioners, exfoliates, facial cleansers, cleansers, toners, makeup removers, anti-wrinkle creams, anti-blemish creams and hydrating creams. Garnier has a rich global tradition of cultivating local spokespersons from the world of arts, fashion and beauty and to complement this tradition they are represented by dynamic actress and celebrated television host Juggun Kazim in Pakistan. The seasoned actress’ natural beauty, flair, professionalism and sense of social and civic responsibility make her a natural choice for Garnier. For Garnier, beauty is within us all. Everyone possesses their own natural beauty and everyone has the power to make that beauty shine through. It’s about taking care.